without which no man shall see God." When meditating on The Transfiguration of Jesus it may be helpful to look at a picture of this event or listen to some uplifting music. The Transfiguration is the fourth of the new Luminous Mysteries rosary and is a key event in the life of Jesus. 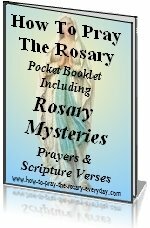 It beautifully complements both the Sorrowful and Glorious Mysteries by adding meditations on the Rosary that gave strength to the apostles during Jesus passion and were a foreshadow of Jesus' glory that was soon to come. As you read this retelling of the Transfiguration, keep in mind that the fruit of this mystery is a desire for holiness. Jesus was transfigured before Peter, James and John on Mount Tabor. When the three disciples and Jesus reached the top of the mountain, Jesus' "face did shine as the sun: and his garments became white as snow." Then suddenly Peter, James and John saw Moses and Elias appear. "Lord, it is good for us to be here: if thou wilt, let us make here three tabernacles, one for thee, and one for Moses, and one for Elias." Jesus did not answer him and a bright cloud came and covered them. A booming voice came from the cloud. The words they heard were, "This is my beloved Son, in whom I am well pleased: hear ye him." This frightened Peter, James and John. Immediately they fell prostrate. Jesus went to them, stooped down, gently touched them then said, "Arise, and fear not." When they arose, they only saw Jesus and the apparition was over. The Transfiguration of Jesus shows the glories that await you if you strive for holiness in your life. Here are some additional thoughts to enhance your meditation on the Transfiguration rosary mystery. Return often to this page when you are praying this Luminous Mystery of the rosay - The Transfiguration. Peter was ready for Jesus' glory. He thought Jesus would set up His earthly kingdom at this time. After all the time he spent with Jesus he didn't understand that there could be no crown without the cross. There are times when we all are like Peter and speak before we think. Try to train yourself to consider how your words will effect others and how they can be used to help or harm a situation. Sometimes being silent is the best solution. You don't always have to be "smart". Let your life be transformed by Jesus. Offer yourself to Him and ask Him to guide you. Jesus transfigured into a glorious state. It was a foreshadowing of the glory to come. This foreshadowing was to give these men strength to endure the sorrow that had to come first. Moses represents the law of the Old Testament and Elias represents the prophets. Jesus is the consummation of the Old Testament. He is the new Law and the fulfillment of all the prophets. These words of the Good Shepherd, Jesus should give you great comfort to face any challenges life has in store for you. This is the second time and the second luminous mystery where God the Father proclaims that Jesus is His Son and admonishes us to listen to Him. The only way to Heaven is through Jesus. There are not many ways and not all religions are equally pleasing to God. Those words absolutely speak for themselves. There are not many ways nor many truths. Believing so is called relativism and relativism is faulty thinking. Furthermore, when you deny the truth when it is staring you in the face, is a sin against the Holy Spirit. This is but one more time when Jesus foretold His resurrection. God the Father commanded, "Listen to him." John is called the beloved disciple for he was faithful to Jesus to the end. He was the only disciple that did not abandon Jesus on His way to Calvary. It is good to note that he only was able to do so by holding on to the arm of Mary. 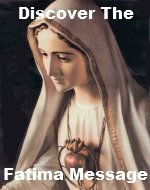 You can suffer much in this life and be very brave indeed if you hold onto Mary's arm by praying her Rosary. Dear Jesus, Thou didst appear to Thy three disciples in all Thy glory. I know that Thou art now in Heaven seated at the right hand of the Father in the same glorious state Thou revealed Thyself in on Mount Tabor. I am truly thankful that Thou hast suffered, died and risen so as to conquer death so that I may be saved from the it's power. I know that I will one day be risen with a glorified body when Thou come to judge the living and the dead. I am sorry for the many times that I have offended Thee by not striving for holiness and by being lazy in my prayer life. Please send me the graces I need to truly desire holiness and to make the sacrifices necessary to achieve it so that I may live my life always mindful that one day I will stand before Thee and be held accountable for all my action and lack thereof.